I'm thinking of boxing my frame at least front and rear. When I was looking at it today I noticed in the rear that the "C" channel frame rail gets wider on the bottom than the top. How is that delt with? Cut the bottom to match the top? Leave it hang out or twist the boxing? I have always suspect that boxing only a portion of the frame and not the entire rail is like sewing a new patch on old jeans. It puts stress on the unboxed portion and that's where all the flex will be concentrated, potentially leading to the formation of cracks. That being said, if I were boxing an AD frame I would keep the boxing plates running parallel, equidistant from the outer vertical rail, tucking them inside the wider portions of the frame and let the wider parts just hang out. The wide areas of the frame lip seem erratic; it would be difficult and look unsightly to try to follow those variations with your boxing plates. The other option would be to grind the wide spots down so the entire C-channel is the same width, but that seems like a masochistic exercise in pointless perfectionism. Be careful: frame boxing is a lot of welding. I've seen frames warped beyond salvation by boxing. The question I have is why? This is a monster of a frame, why do you think it needs boxing? It's not a Model A that you are putting a blown small block in. I'm putting a blown 292 in it with 10 or 12 inch tires. I would also x brace the frame. I need to put x bracing in for my Bicknel torque arm slide to mount on. I still don't think you need a boxed frame. I don't know, I ran a mid engine Buick 401 and would get zero wheel spin at the drags kicking the big boys in 60 ft time and I certainly never needed it. That frame is pretty stout. Just because you have a beefy motor doesn't mean you will be transfering all that power to the ground. And not only that but how often? Will it really make a difference in the "use" of that truck? I am asking you these questions because I don't have every answer, I just have the questions for you to answer for your truck. It's not a Model A or a 32 Ford, it's got "K" members in it already, it's a pretty tough frame. I have seen blown big blocks in them I don't know, unless you plan on being at the drags every week on slicks, I just don't see a need. Spend some time studying the need before you get into this, that is a BIG project and it can cause you more trouble than you can imagine. I have fixed bent frames and rear ends and stuff that were warped from welding. There is a LOT of heat welding something like that. 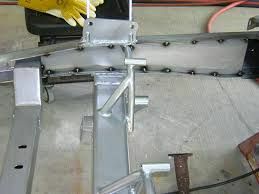 I have seen frames that needed a bunch of work after cross members were welded in. Just putting out some red flags, do your homework. check out welderseries.com Paul Horton has some great tubular cross member kits as well as tubing by the foot. great guy besides. Usually frame boxing is done when you are modifying the original suspension or mounting a drivetrain not originally designed for the chassis. Which, is exactly what you're doing. The general concensus is that cross bracing does more to prevent frame twist and stiffen the chassis than anything. Anyhow, I noticed on my 54 the same thing you are stating. The flange on the lower part of the frame is wider than the top. I'm probably going to have to do a small c notch on the rear, so I was thinking of just letting the lower overhang. When I did the front IFS, I trimmed the frame rails to be plumb. I'll be the first to admit I don't know much about this. I considered buying a new chassis but nobody makes anything near to what I need. I'm running a tubular straight axle being made by Pete and Jake's 4" drop. My blown 292 will have to be moved back about 6" and trans cross member for TKO 600, mid shift kit. I will be running 2 batteries. I need to mount electric A/C compressor and remote condenser, electric vacuum pump. I would like to allow for mounting under the truck for these things. I should be getting my alum 12 port cross flow head soon and need to allow for exhaust. I also have one of my engineers designing a 4' scissor lift bed with Acme screws and 12 volt DC motors. Also as stated my Bicknel torque arm. I'm keeping my leaf springs. That's a lot going on down there. All of the engineering is beyond me. I am lucky to have access to people that love working this stuff out. I am always looking advice from the experts here. Thank you for your time. I plan on bending tubing and tacking. I will probably have a real welder do the final welding. I also have access to many TIG welders that do stainless pipe welding on the factories I build. A man has to know his limitations. My idea is to have boxing plates, tubing and lift done in polished stainless but I haven't thrown them that curve yet. If you remove the crossmember under the bellhousing it is wise to box or otherwise reinforce the frame. Otherwise the weight of the cab will twist the tops of the rails out over time and the cab will settle to the rails. That isn't If but when it happens as it will happen. We have learned a lot about welding on our trucks an hot rods and customs over the past few years and the main thing is that we DON'T RUN LONG CONTINUOUS BEADS or it will warp/distort the metal. Along with that it is a good idea to have the frame on some sort of frame table or jig during the process or at least solidly sitting level on saw horses or stands. The guy who did a bunch of welding on my frame years ago welded in a warp because we didn't think it out and do things right. As for trimming the plates make cardboard patterns and I'd suggest setting the boxing plates slightly inside the rails edge like 3/8 of an inch as you see in this photo of a Ford frame. That lets you get a good weld in the V area between the rail and the plate and also lets you set the brake an fuel lines inside the edge of the frame rail just a tad. That's great advice. I have a friend with a water jet cutter that will make them for the cost of the material at most. I would also agree that adding diagonal bracing is going to make a huge difference. Last edited by 1project2many; 04-15-2019 at 01:47 PM. there is also the theory that making a new frame and cross members from rectanguar tubing could be easier than boxing the original frame around cross members etc. to do it properly you would really need to remove the cross members so you would end up with a couple of rails and cross members sitting on the shop floor. if not then you end up with spaces where the cross members are now. like mentioned earlier those spaces mean weak spots where flex can happen. talk to a frame shop and get some possible answers.